The author is a beef cattle specialist for Texas A&M AgriLife Extension based in Overton, Texas. Winter annual pastures can be a great option for lowering winter feeding costs by extending the grazing period and reducing or eliminating the need for traditional protein and energy supplements for cow-calf operations. Cool-season annual forages used for winter pastures primarily include small grains, ryegrass, clovers, and medics. In recent years, brassica species such as turnips, radishes, and kale have seen more use. 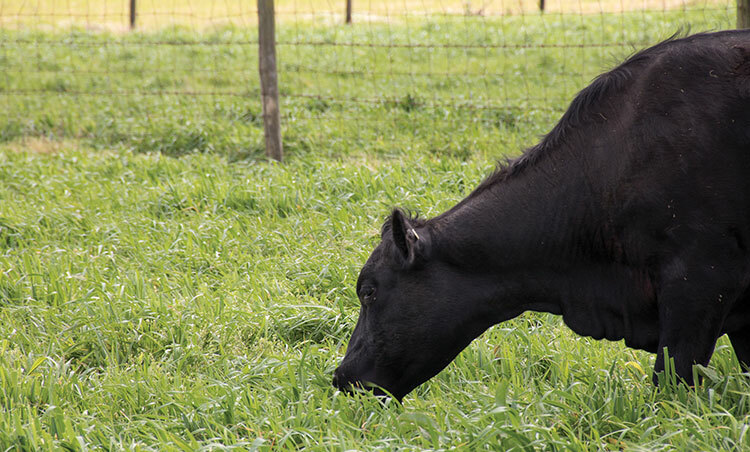 In cow-calf operations, grazing recommendations will vary depending on the calving season. During the last third of gestation, limit-graze cows and heifers to prevent larger than expected calf birth weights due to the high levels of protein and energy found in most winter pastures. One approach is to graze spring-calving cows and heifers on winter pastures for approximately two hours per day. An alternative approach is to graze for one day and feed hay or graze dormant warm-season forages for four or five days before grazing winter pastures again. These limit-grazing approaches can completely replace cubes and other traditional protein and energy supplements. If forage availability is adequate, it works very well to graze pairs full time, both cows and calves will excel in this situation. Provide a moderate or high-magnesium mineral (about 5 to 10 percent magnesium) to cows grazing winter annual forages to help prevent potential problems with grass tetany. Grass tetany is a condition characterized by low blood magnesium levels. Good consistent consumption of the mineral is more important than the amount of magnesium in the supplement. Magnesium reduces the palatability of mineral supplements, so monitor intake to ensure that target consumption levels are obtained. If consumption targets are not being reached, consider switching from a high to a moderate magnesium mineral. Additionally, look at other mineral suppliers because palatability of loose minerals can vary greatly from company to company. Make sure there is an adequate amount of salt in the mineral supplement; salt is critical to the absorption of magnesium. Most quality loose mineral supplements designed for an intake of 3 to 4 ounces will contain about 15 to 20 percent salt. Some molasses-based mineral tubs do not contain any salt. If this is the case, provide salt along with the mineral tub. Risk factors for grass tetany are influenced by stage of production, cow age, forage species, and dietary potassium content. Cows with young calves are at higher risk than cows with older calves or nonlactating cows. Risk elevates as cows age because magnesium absorption falls with age. Consequently, older cows with young calves are at the highest risk for grass tetany. Clovers and medics are generally higher in magnesium content than grasses, so the risk is lower for cattle grazing pastures with these legumes. High dietary potassium levels can reduce magnesium absorption and raise the risk of grass tetany. Some brassicas may contain 6 to 7.5 percent potassium compared with the 1.5 to 3 percent levels commonly found in small grains and ryegrass. Be especially mindful of grass tetany if brassicas are included in the mix. Grass tetany is not a problem in stocker cattle because of differences in dietary absorption and the ability to mobilize magnesium from body stores compared with cows. However, inadequate calcium in the diet can limit the performance of stocker cattle and replacement heifers grazing winter forages. Providing at least an additional 10 grams of calcium per day through either a high-calcium mineral supplement or some other supplement can enhance average daily gain. Bloat risk will vary with forage species, geographic location, time of year, and plant maturity. Legumes are more bloat prone than grasses. Risk can also be higher during the late winter and early spring. Additionally, as forages mature the risk of bloat declines. Bloat problems often occur as a result of turning hungry cattle onto bloat prone pastures. Make sure cattle have consumed some hay or other roughage prior to turnout. In rotational grazing situations, rotate the cattle while they are not overly hungry. The cost per ton of forage produced for winter annuals will vary depending on species planted, seeding rate, fertilization required, and forage yield. Generally, the range will be from $35 to $90 per ton of forage dry matter. For example, if it costs $94 per acre to plant annual ryegrass ($14 for seed, $5 for planting, and $90 for fertilizer) and 5,000 pounds of forage was produced, the cost per ton of forage would be $37.60. This is very inexpensive for a feed source that will exceed 15 percent crude protein and 65 percent TDN (total digestible nutrients) for a large portion of the growing season. Take advantage of winter annuals to lessen winter feeding costs and keep cows in good condition. Additionally, enjoy gains of 2 to 3.5 pounds per day at a very low cost for replacement heifers and stocker cattle. This article appeared in the January 2017 issue of Hay & Forage Grower on page 16.